The one subject I would like to raise in connection with the post-2015 development agenda is rebuilding after natural disasters and civil conflicts. This topic includes economic, social and cultural rights of course, but also making sure that a human rights approach is used in rescuing and rebuilding people’s lives. 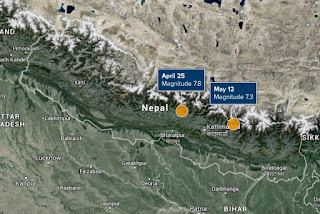 The Nepal earthquakes. For example, within two weeks of the first of two major earthquakes in Nepal, over fifty countries were reported to have contributed rescue teams, supplies and/or aid to the country. All of these countries of course have human rights treaty commitments; 43 of the 50 are a party to the CRPD; and 35 of the 50 had appearances coming up in the treaty body system during 2015. It is suggested that a few questions be reserved in the constructive dialogue with state parties to ask about human rights issues in such disasters. Was a human rights approach used in the way that emergency/rebuilding assistance was delivered and implemented? Were vulnerable groups consulted in how local communities were rebuilt or priorities established? Every human rights treaty has some provisions relevant to a disaster situation. Some, like CRPD, directly address ensuring the protection and safety “of persons with disabilities in situations of risk, including situations of armed conflict, humanitarian emergencies and the occurrence of natural disasters” (article 11). All treaties have obligations relating to international cooperation. Most treaties have no limit regarding the protection of human rights only to its own territory but speak in terms of the human rights of “all persons” who are affected by its actions. It is recommended that the treaty body system establish a task force composed of representatives from each of the treaty bodies to identify both common and unique issues in their respective treaty instruments regarding human rights obligations of states in times of natural disaster, and that this topic be made a regular part of each Committee’s constructive dialogue and report reviews with state parties when that government has been involved either directly or through aid efforts in a natural disaster or civil conflict situation.